When it comes to starters, I love to try new things. The options for vegetarian-friendly grilling are endless. 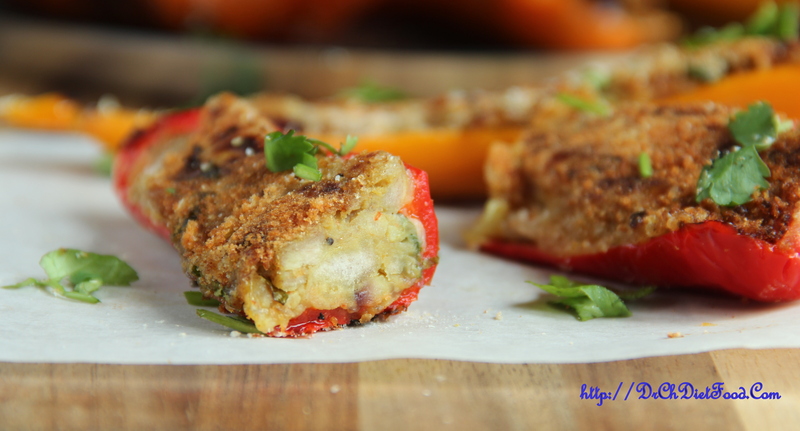 These stuffed peppers combine two of my favorite ingredients Plantains and Peppers. Plantain which is used for filling or it can be a nice light dinner served with a salad. These peppers are definitely different from jalapenos – they aren’t as spicy, and are a little sweet. So this combo makes the starter like a Tangy taste. Cut the ends of the plantain, peel, slice and steam cook plantains until tender. Transfer the plantain to the bowl, Let the plantain cool enough to handle and mash it in a bowl. Heat oil in the pan add in garlic, onion and saute for 2-3 minutes or until translucent. Add in mashed plantain, salt, chilli powder and drizzle some water (to avoid sticking to the pan) mix well and cook for a minute. Turn off the flame and drizzle some lemon juice, coriander and set aside. Wash and Cut peppers in half-length wise, remove seeds, membrane. 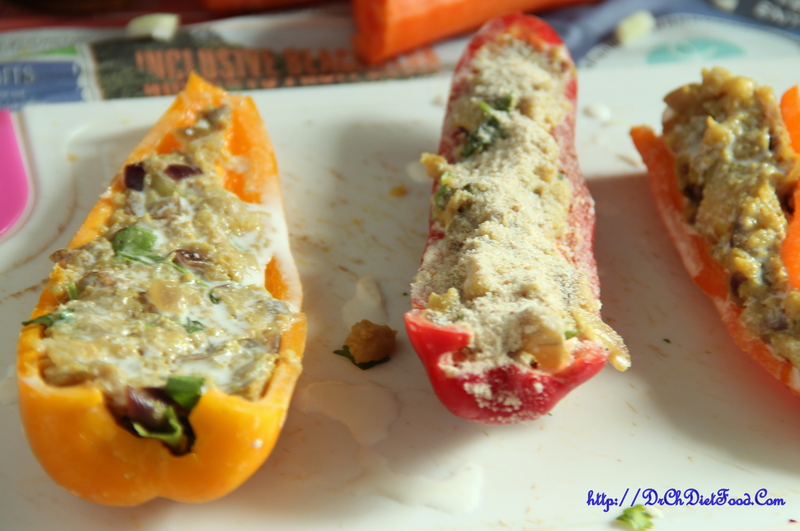 Stuff each half of the peppers with plantain mixture, top each stuffed peppers with bread crumbs. Heat a skillet/pan on a medium heat grease some oil to the pan and place the stuffed peppers (I did it in batches- so place as per the size of the pan) and cook for 2-3 minutes, flip and cook on the other side for 2-3 minutes/ until cooked. Garnish with some fresh cilantro/coriander and serve. 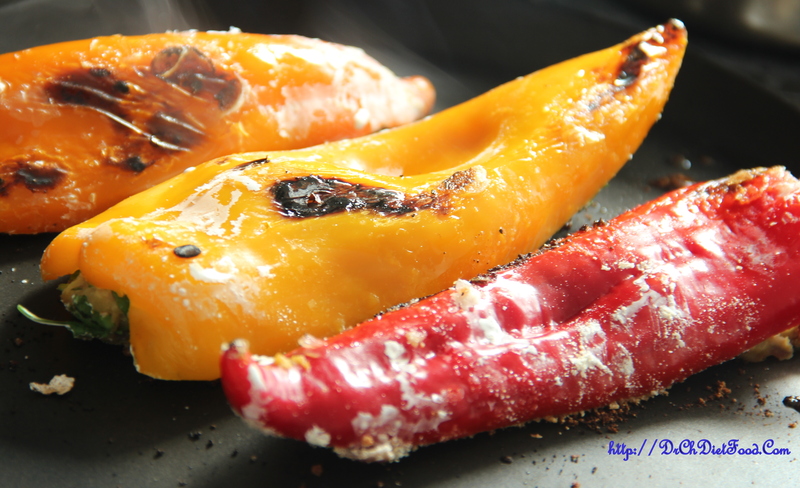 Cooking time varies on the type of pepper so make sure to cook on a medium flame until peppers are tender and cooked. Stuffing can per personalised as per the taste. Stuffed peppers can also be baked in the pre-heated oven at 180 deg C(Fan assisted) for 15-20 minutes. Posted on April 10, 2015, in Appetizers, Indian, International, Starters. Bookmark the permalink. 22 Comments. You are so endlessly imaginative! I also like to try new dishes and I have a vegetarian son who I know will like this one. So nice to hear that Mary. Love all the veggie stuff!